The startlist is a bit uncertain, but about 204 riders started and there were 40 classified finishers. Only 18 of the riders were on sponsored trade teams, the others rode as independents. Alfredo Binda lost enough time in a crash in the first stage to be out of contention. He put himself at the service of teammate Giovanni Brunero, who became the first 3-time Giro winner. Marco Persecchetti (independent) @ ? The Binda-Girardengo-Brunero rematch. 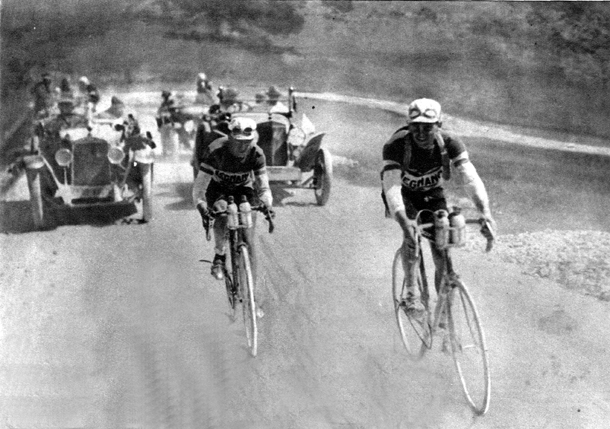 With 204 riders, the 1926 Giro peloton was huge. The three big guns were on the line May 15 to start the twelve-stage race that went as far south as Naples before returning north. Binda and Brunero along with Linari were on the Legnano-Pirelli team. Girardengo and Bestetti were on the Wolsit-Pirelli squad. There were just two other teams, Alcyon-Dunlop and Olympia-Dunlop, making only eighteen of the Giro’s riders trade-team sponsored. The other 186 riders were independents or isolati. These riders might not have been of the caliber of Binda or Girardengo, but several of them rose above the normal level of the unsponsored rider. 1924 winner Giuseppe Enrici and other long-time Giro veterans such as Angelo Gremo, Giovanni Rossignoli and Luigi Lucotti were riding the Giro on their own account. The first stage was the well-used Milan–Turin route. Binda crashed while descending the Serra, remounted and then somehow broke one of his brakes. All of this cost him over half an hour. Sure that the Giro was already lost he decided to retire. His team argued with him to continue and finally prevailed upon him to get back on his bike. Meanwhile, the peloton had been shattered by the efforts of the leading riders. Two from the Alcyon squad, Domenico Piemontesi and Egidio Picchiottino along with Olympia rider Arturo Bresciani had broken away. Piemontesi won the stage, becoming 1926’s first Giro leader. Girardengo led in a small group 15 minutes later while Binda arrived 37 minutes after Piemontesi. If the trumpeter were going to win the Giro he had his work cut out for him. But, as it turned out, Binda changed his goal. 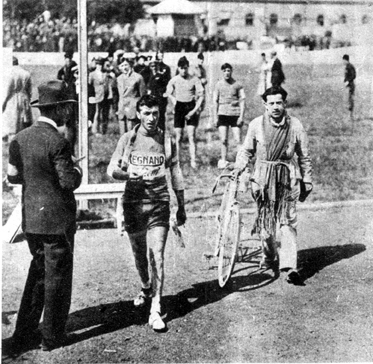 He put himself at the disposal of the teammate who still had a good chance of winning, two-time winner Giovanni Brunero. No one could ask for a finer or more powerful helper. Binda was the ultimate gregario di lusso. Two days later Binda lost even more time, confirming that he could not win this Giro. Meanwhile, Piemontesi was riding in a state of grace. Over the Ligurian hills to Genoa he again soloed in two and a half minutes ahead of Girardengo and Brunero and a full nine minutes in front of Binda. Piemontesi must have thought this Giro was certain to be his. Binda might have given up any hope of winning the overall, but he wasn’t done racing. The 312-kilometer third stage, into Florence, allowed him to display his incredible talent. His solo win, four and a half minutes ahead of Brunero and Bresciani and five minutes faster than Girardengo, showed that while General Classification lead was out of reach, he could certainly win individual stages. Finishing behind Girardengo by 30 seconds, Piemontesi lost a bit of his overall lead. Linari’s Giro was over after he crashed into a motorcycle a few kilometers outside Florence. Binda had brought himself up to ninth place, 40 minutes 46 seconds behind Piemontesi. It has been written that representatives of Wolsit (with Binda and Brunero) and Legnano (Girardengo and Belloni), the two teams that mattered in this race, would meet in the evening to discuss the next day’s racing, even mentioning potential attacks and ways to make the race more entertaining for the fans. Given that both teams had the same owner, Emilio Bozzi, it’s not too surprising. If this indeed occurred, I have no idea how this actually affected the race’s outcome. The three best Italian riders left everyone behind in the fourth stage that went over the Apennines into Rome. Girardengo, Binda and Brunero (together, in that order) beat a badly fragmented peloton into submission. Bresciani managed to lose only ten minutes to the trio but the rest struggled in from thirteen minutes to three hours after the stage had been won. Alfredo Binda and Giovanni Brunero approach a stage finish. Piemontesi’s Giro ended in crisis in the Cimini hills northwest of Rome where he abandoned. After exhaustion forced him to give up what looked to be a sure Giro victory, he threw himself into a ditch in despair. We’ll meet up again with the man the press named the Cyclone of Borgomanero whose trademark phrase was O la va o la spacca, roughly translated, “make or break”. Racing into Naples, the same trio again left the rest of the field behind. Binda was now in fourth place. The sixth stage was mostly more of the same, except that Binda managed to outsprint Gira. Heading north on the east side of the peninsula from Foggia to Sulmona, Girardengo’s famous bad luck struck again in the mountains of Abruzzo. A sprain forced him to again withdraw from the Giro while he was in the lead. The tifosi could hardly believe their campionissimo was human and were furious with the man who seemed to have misfortune hang on him like a cheap suit. Teammates Binda and Brunero beat the stage’s third place rider by over 25 minutes, making Brunero the new leader while Binda was slowly clawing his way back up the standings. Without that catastrophic first-day time loss he would have been in the lead. Binda went on another streak. He won three of the last four stages, always with race leader Brunero right at his shoulder. Bresciani was a victim of their powerful alliance, losing his second place in the eighth stage when Brunero, Ermano Vallazza and Binda left the peloton eight minutes adrift. Although credit has to be given to Galetti for three Giro victories (his third victory was as part of the team-race in 1912), Brunero became the first official three-time Giro winner. This had been a particularly wet and therefore muddy Giro. Of the 204 riders who left Milan only 40 returned. Giovanni Brunero was a brilliant climber as well as fine rouleur, yet for all of his robust strength he died in 1934 when he was only 39. It was said that his lungs were destroyed by the unavoidable dust raised by bicycles racing over dirt roads.